Bradley Steven Bergeron, Kelly Chapin Schmidt and Jimi Kocina. Photo by Bill DeLoach. A quirky group of six adolescent outsiders vie for the spelling championship of all time, under the tutelage of three equally quirky grownups. This hilarious tale of overachievers’ angst shows these unlikely heroes learn that winning isn’t everything, and losing doesn’t make you a loser. This Tony Award-winning musical debuted on Broadway in 2005.
Who knows? You may just be invited on stage to compete in the Bee! 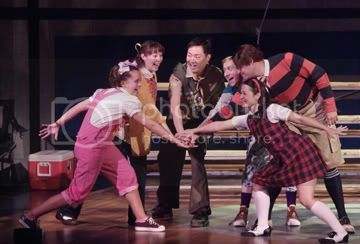 Cast members from GET’s “The 25th Annual Putnam County Spelling Bee.” Photo by Bill DeLoach. Recommended for ages 13 and up due to some adult content. FOR MORE INFORMATION, VISIT US ONLINE AT www.get.org. 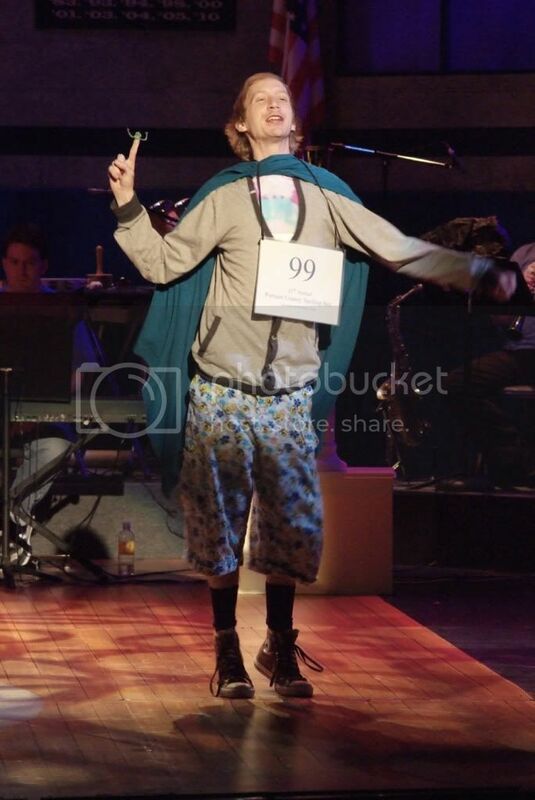 Jimi Kocina as Leaf Coneybear. Photo by Bill DeLoach. *Denotes performance eligible for discount offer. Many thanks to our corporate partner on this production, The Kimberly-Clark Corporation. Simply call the Georgia Ensemble Theatre at 770-641-1260 by 5pm on Friday, November 19, 2010, and reference this email coupon to take advantage of this offer to see “The 25th Annual Putnam County Spelling Bee” at Georgia Ensemble Theatre. Discount available for performances Friday, November 19, 2010 at 8pm, and Saturday, November 20, 2010 at 4pm & 8pm only. Not valid for already-purchased tickets. Discount may not be combined with any other discount offer. Not available with online ticketing. Payment required at time of reservation. Bring copy of coupon with you to Box Office when picking up your tickets. Limit: two tickets per coupon. previous post: Don’t M-I-S-S “The Bee” at Georgia Ensemble Theatre!